Our Gresley First Class Sleeper, built in 1935, came to us from the Strathspey Railway. It is historically important as it was the last wooden bodied sleeper to run on British Rail metals being finally withdrawn in 1972. 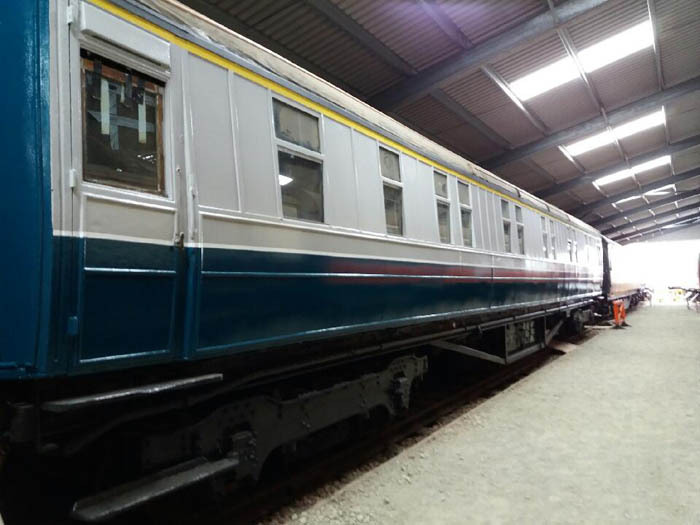 Our intention was to re-skin the carriage and to "do up" three of the compartments for public viewing in the museum. The two centre compartments (5 and 6) have an adjoining double door, and this was to be restored to a 1935 look. One of the other compartments would be returned to 1970s condition to give a "then and now" look. There is a photographic history of the re-skinning on Flikr. After removing as many panels as were rotten, the framing was repaired where required, then new 9mm marine plywood was used to re-panel initially the north side. After filling and sanding countless screw holes, half-round mouldings were pinned in place to cover the joins between the panels. Al McPhee was the driving force behind painting the north side and ends in blue and grey 1970s livery. He also made and painted new battery box covers to replace those which were missing. 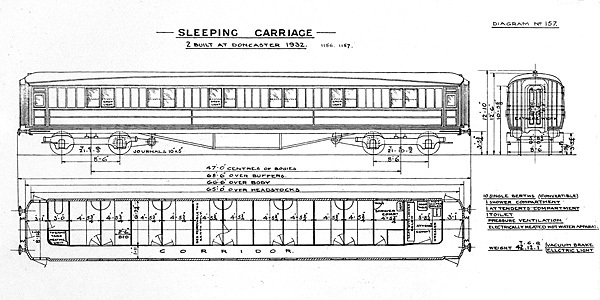 The drawing of diagram 157 to which this carriage was built is based on the LNER Diagram Book. Steve Banks website has a very interesting discourse on 66' 6" Gresley sleepers. Click here to visit. 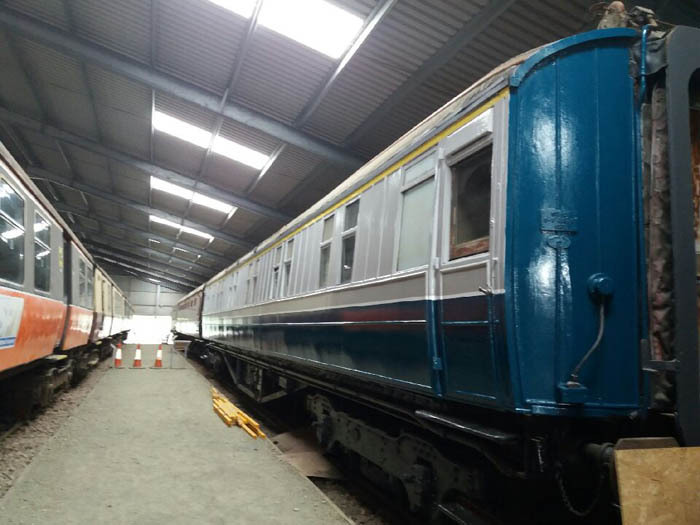 The sleeper was in the museum shelter during 2016-7 where the above photo was taken. The north side is seen here - the south side was against the wall of the Reserve Collection Building. These photos courtesy of A McPhee. You can view a photo of 1211 at Boat of Garten in as withdrawn condition here. After completing the north side of the carriage in the summer of 2017, re-panelling the south side was started. All the lower panels had been fitted by the end of September 2017, so then the fitting of the half-round covering mouldings started. It was known when we acquired the vehicle that it contained asbestos. In September 2017 contractors were invited to look	at dealing with the material. Rendering the vehicle safe for the public to visit the interior was going to be expensive.